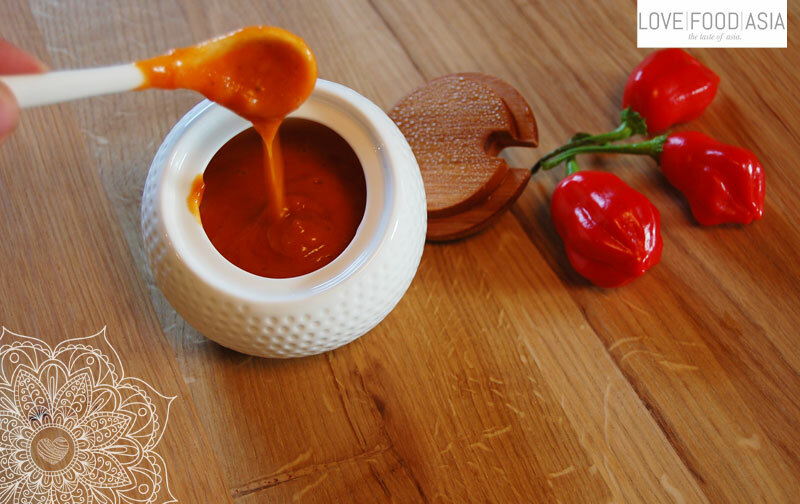 Here´s a recipe for a spicy and also fresh chili sauce made of fresh red chilies from our own garden. You eat it best with all kinds of meat and fish and use it as an ingredient for many asian dishes. Fry onions and garlic in a small pot until glazed. Add palm sugar and stir until sugar is caramelized. Add the remaining ingredients and simmer on low heat for 1 ½ hours. If sauce is to thick you can add some vinegar. If it´s to liquid simmer a bit longer until the sauce is creamy. Use a blender to make it a creamy sauce. Transfer warm sauce in preserving glasses. Stand on the lid side and leave there until it´s cold.